Originally from California, Brian came to Coos Bay in 2014. Even though he has been in Coos County only a few years, Brian has taken a deep interest in our community. He is on the board of Connect the Boardwalks, the Coos County Emergency Response Team (CERT), and our local chapter of the American Red Cross. 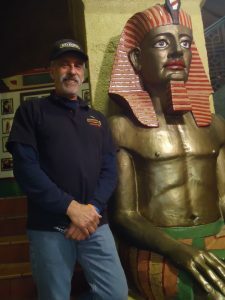 Brian has been a valuable volunteer at the Egyptian Theatre for the past year, working behind the concession stand, in the box office and performing numerous handy‐man tasks through‐out the theatre. Brian’s work history covers many areas of construction, management and consulting. Brian is an independent licensed real estate agent with a strong background in property development, management and maintenance. He also holds a California general contractor license and has extensive hands‐on experience in residential, remodel, rehab and conversions. Of particular interest to the Egyptian Theatre Preservation Association, Brian’s construction experience includes working on historic building restorations. In addition, he brings with him a wealth of knowledge in Fair Housing, anti‐discrimination and tenant rights laws, dispute resolution, risk management, and health and safety compliance. He has even served as an expert witness in lawsuits involving illegal additions, zoning and code violations, fraud and unethical business practices of Real Estate agents. Brian believes that the Egyptian Theatre is a “jewel in downtown Coos Bay” that deserves to be restored and preserved. The ETPA whole‐heartedly agrees with him.